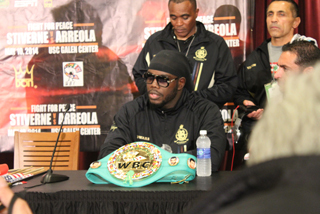 After waxing off Riverside Mexican Chris Arreola in a 6th round TKO to capture the prestigious WBC heavyweight championship, 35-year old Bermane Stiverne says he didn’t know what he was feeling. “I first of all want to thank my lord and savior Jesus Christ, but I can’t explaine how or what I am feeling right now,” said the Haitian born, Las Vegas based champion. Stiverne gave Don King another heavyweight champion and thrust the legendary promoter back into the bright lights of the sport of boxing. The first fight was in the history of the USC campus arena at the school which owns the ‘Fight On’ moniker. It took about six minutes for the rematch to heat up, but it was clear after the first round that it was not going to last the scheduled 12 rounds. After an uneventful opening round, Stiverne took the best Chris Arreola had to offer without going down, and then in the six round, Stiverne heated up the stiff jab and caught then a looming game changing over hand right that sent the Arreola sprawling to the canvas. A game Arreola wobbled to his feet, but it was just a matter of time before the nightmare became a reality for him. Stiverne pounced and delivered the closing shots. Now, with the heavyweight champ in tow, one who lives in America and is Black from Haiti, King can now begin flex his muscles again and his champ can ignite that for him. While many of the local boxing fans came to the USC Galen center to watch the WBC Heavyweight Championship showdown, the unblemished rising star on the card was Amir Iman at 140 pounds. Iman, fighting out of Florida and by way of Albany New York, improved to 12-0, with an impressive veteran like unanimous decision over rugged Cuban Olympian Yordnis Ugas. Promoted by legendary icon Don King, Iman was precision accurate, rifling jabs and busting Yordis up with rocket right hands with regularly. The 23-year old is the most polished young fighter that King has had since International Boxing Hall of Fame inductees Felix Trinidad. The bout was his first outside of four rounds (an 8 round attraction), but chances are he will be a terror at 140 and potential champion at 147 down the road.